On an elevated ridge surrounded by Sierra pines is a large structure topped by cedar and copper towers shaped vaguely like Native American teepees, which at initial glance seems an incongruous apparition in this relatively remote and sparsely populated section of Northern California’s Plumas County, about 45 miles north of Truckee. But a closer look at the 27,000-square foot building, with stacked slabs of natural stone and low-ceiling passages leading to a soaring central room with a massive four-sided fireplace, brings familiarity to anyone remotely conversant with American architecture. The clubhouse at the Nakoma Golf Resort and Spa was clearly designed by the one and only Frank Lloyd Wright. How it got here, more than 40 years after the colorful architect died and nearly 80 years after he sketched the plan, is a tale as interesting as the evolution of Nakoma’s golf course. 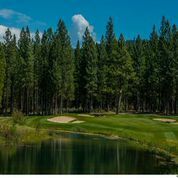 Designed by the late Robin Nelson and opened in 2001, the par 72 track runs through the pines and up and down rocky terrain that sits above a gorge carved the rushing white water of the Feather River. Called The Dragon and originally marketed as “The Toughest Course in California,” it indeed brought in players determined to tackle a Targaryen beast. Smoked like the bad guys on Game of Thrones, few returned. Now greatly softened – – with wider fairways, bunkers more amenable to escapes and with less severe slopes on greens – – The Dragon plays like a proper resort course, challenging and yet inspiring fun. The clubhouse is still the resort’s main anchor, and features an expansive outdoor patio that overlooks the Sierra, the forest and the Feather River far below. Its Wigwam Room restaurant serves nouveau American cuisine for breakfast, brunch, lunch and dinner, on varying schedules depending on the season, and the building includes an indoor heated current pool, a fitness room, steam room and offers spa services including massages, facials and nail care. Along the 10th fairway are 12 Villas, all of which echo the clubhouse’s architectural style. In studio, one and two-bedroom configurations, the Villas provide overnight accommodation for public guests and members of Nakoma’s Residence Club. A Chippewa word meaning, “I do as I promise,” Nakoma therefore calls to mind of a native American encampment. Taken together, the facilities are a complete stay-and-play alternative to the more crowded resorts near Lake Tahoe. In 1923, Frank Lloyd Wright developed the basic concept of a clubhouse for a golf course in Madison, Wisconsin. It was never built, and the plans remained in a drawer for nearly eight decades. 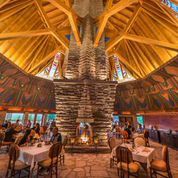 Nakoma’s original owners purchased the plans from Wright’s legacy organization, Taliesin Architects, a Scottsdale, Arizona firm that descended from Wright’s one-time apprentices. Like so many of the architect’s designs – – including Fallingwater and the Marin County Civic Center – – the Nakoma building reflects the surrounding landscapes, acknowledges a specific history and culture, and yet looks timelessly futuristic. All graduates of the Frank Lloyd Wright School of Architecture – – which has campuses at the original Taliesin in Spring Green, Wisconsin, and Taliesin West, in Scottsdale, Arizona – – Wright’s disciples oversaw the construction of the clubhouse. They also developed the designs of The Villas, also in Wright’s signature style and something of a Native American motif. For example, each Villa wraps around a central stone fireplace, just like the main room of the clubhouse. (Each Villa also features a private patio, hot tub or indoor sauna, and bathrooms with spa tubs and walk-in showers.) 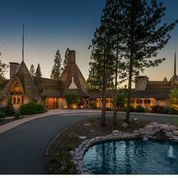 The roofline of the main clubhouse is in a geometric shape, and includes stained-glass windows inspired by Native American shapes, which cast color light on the stone-clad interior walls. Although Nakoma’s founders got the buildings right, today’s owners – – the Schomac Group from Tucson, Arizona – – has made much needed changes to the golf course. Robin Nelson, who died of ALS in 2012, would very much approve. The superlative designer intended to fashion a pleasing resort course for what originally would serve residents in a private planned community. The original owner believed that a brutal course, marketed with the tag line, “Send Me Your Heroes,” would entice golfers from around the world. Although Nelson had help from LPGA Hall of Famer Patty Sheehan, the owner’s desire took precedence during construction, as is true for nearly every architect in the golf business, however famous. Rest in peace, Robin, because the player friendly course now more accurately reflects your design principles. Golfer will challenge The Dragon, and come back for another shot many more times. There is much more to Nakoma than golf, the clubhouse, spa and the Villas. There are cycling trails throughout the property and nearby activities include hiking, mountain biking, horseback riding, kayaking and fishing. In the winter, skiing, snowshoeing and other related sports are close by. The costs here are eminently reasonable. Green fees range from $50 to $95 per round, while juniors paying only $35 on weekdays and $45 on weekends. One can also purchase an interest in The Residence Club at Nakoma, or RCN, to attain a lifetime of lodging and golf privileges. Club members received frequent and flexible lodging during each high season, winter and summer. It not only has the advantages of vacation home ownership, but the amenities of a resort, a superb golf course and hotel services. Indeed. RCN members also receive concierge services, including housekeeping and grocery shopping while staying at the Villas, and more. Prices on equity fractional ownership of the Villas and Residence Club start at $49,750 and top out at $89,625, with annual membership fees ranging from roughly $5,600 to $6,600 per year. For more information call 800-284-8820, or click on www.residenceclubatnakoma.com.